The AudioBox iTwo is our most versatile bus-powered audio/MIDI interface, providing two combo mic and switchable line/instrument inputs with a high-performance mic preamplifier. In the studio or in the field, it’s great for recording synths, guitars, and anything you can capture with mics. Compact and ruggedly built, AudioBox iTwo is a complete solution for mobile musicians, sound designers, and podcasters. Read more about the AudioBox iTwo. No other entry-level recording and production software is this easy to learn and use, yet is capable of creating studio-quality output. Studio One® 3 Artist lets you work quickly and stay focused on your inspiration, offers unlimited tracks and plug-ins, and delivers features not normally found in entry-level DAWs. Access powerful editing tools without wading through menus. Load and save audio clips, MIDI files, and effects by drag-and-drop. Studio One makes it easy! Read more about Studio One 3 Artist. Based on Capture™ live-recording software for StudioLive® mixers, Capture Duo lets you record two stereo tracks with up to 24-bit, 96 kHz fidelity using the AudioBox iTwo, another MFi audio interface for iPad, or the iPad’s built-in mics. You can wirelessly transfer recordings directly from Capture Duo to a Mac or PC running Studio One, then edit, sweeten, overdub, and mix with the power of a world-class DAW. 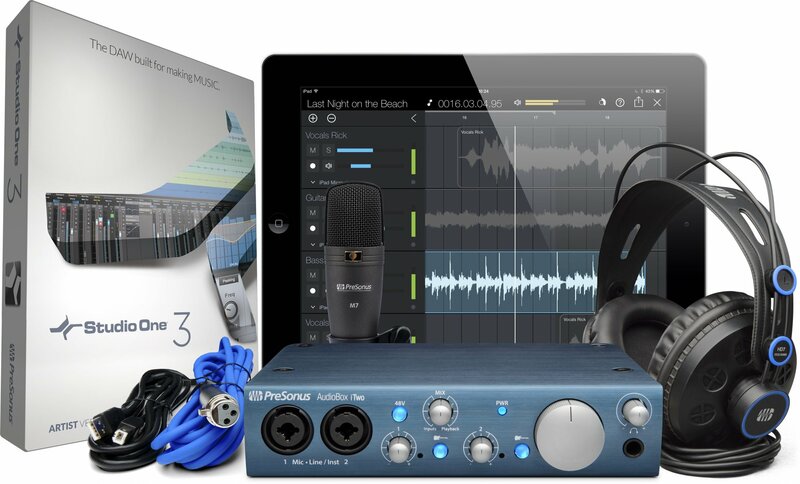 If two tracks aren’t enough, purchase the low-cost, 32-track Capture for iPad to create a truly mobile professional recording system. Read more about Capture Duo and Capture for iPad.